I've recently bought the PNY Optima 120GB SSD for use in my old motherboard, the ECS A780GM-A Ultra. It has only SATA 2 controller and using the AMD SB750 chipset. The BIOS is set to AHCI mode and the SSD was installed as the only drive. Notice the huge amount of Retired Block Count. I've since RMA the SSD. However I'm wondering if it's just bad luck the first time or was it a certain compatibility issue with my mobo and the SSD. Is it even possible for incompatible controller to cause actual damage to an SSD, things like shown in the screenshot? FYI, my 2 HDD have been working fine without issue all these years though. Hard to know in a sample size of one. PNY is not a brand we recommend, but that doesn't mean they're bad. They just don't sell much product so we pretty much ignore them. Just some more info, from the 3 days I have the drive, the number stayed the same. It was a brand new drive and the numbers were like that since day 1. I've read some users report that HDD Sentinel show 9% health because of the high number of bad blocks. I also read that some tool may interpret the SMART data incorrectly in the case of SSD. It wouldn't have bothered me so much if the speed is OK, but it is far from OK. I tested with Hdtune and I only got 8-15 MB/s, which I can confirm by how slow it was to boot Windows and with copying files etc. 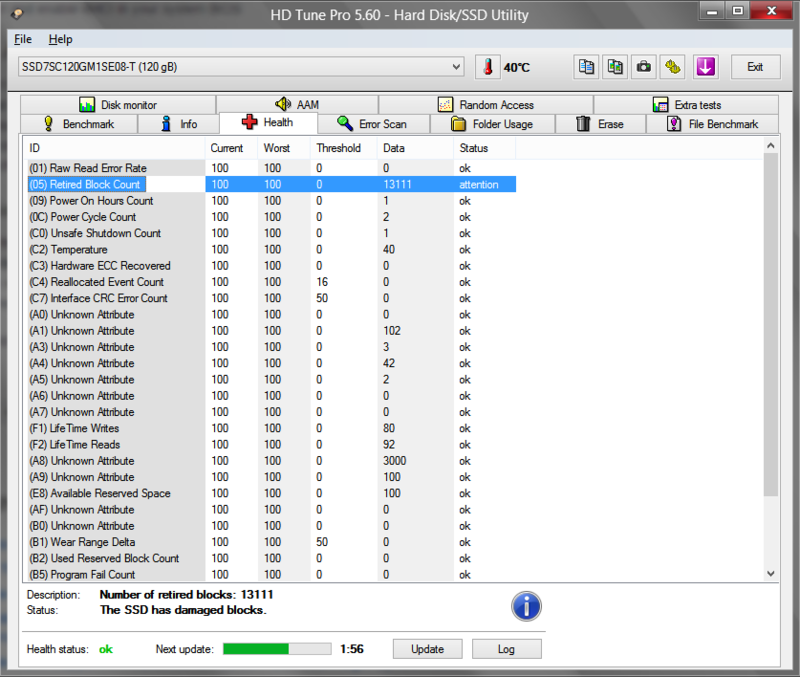 HD Tune isn't a particularly great benchmark on SSDs, try something like ATTO, CrystalDiskMark or AS SSD. OK, will use those on my next test. Last time I used HDD Sentinel, HD Tune and Crystal Disk Info to get the SMART data and all of them report the same value, although IIRC, Crystal still reports Good health despite the bad blocks.